Both emergency tanks for the water detritiation system, 100 cubic metres each, have now been delivered to the ITER site. In the course of ITER operation, part of the tritium injected into the machine will not be "burned" in the fusion reaction. The leftover tritium will be pumped out (along with helium ash), separated and recycled to be reinjected into the plasma. In the basement of the ITER Tritium Plant, four storage tanks and two emergency tanks (for "off-normal" events) will handle the water involved in the recycling process. 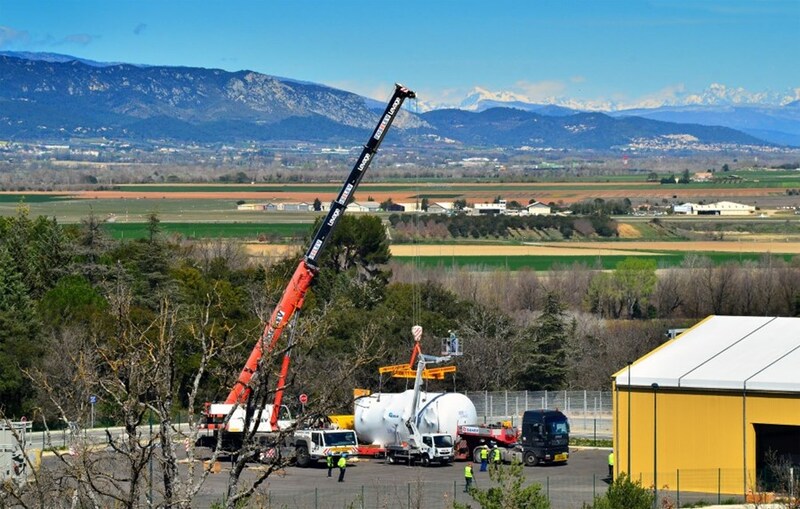 The emergency tanks, 100 cubic metres each, have now been delivered to the ITER site. Procured by the European Domestic Agency and manufactured in Spain, the first tank arrived on 20 March and the second on 2 April. The four storage tanks (4 tonness each, 20 cubic metres) are expected in the coming months.